This is an original glass slide that was sent to a movie theater in Green Bay, WI in 1917 & 1918 to show between films giving current news and events. 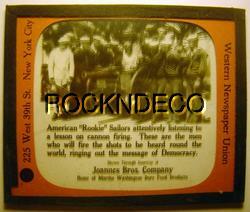 This glass slide's caption is "American Rookie Sailors attentively listening to a lesson on cannon firing. These are the men who will fire the shots to be heard round the world , ringing out the messageof Democracy." "Shown through courtesy of Joannes Bros. Company - Home of Martha Washington Pure Food Products". This glass slide was produced by the Western Newspaper Union of New York. The slide measures 3-1/4" x 4". The glass slide is in good condition - there are a couple light scratches. A NICE PIECE OF WORLD WAR I / NEWS MEMORABILIA! Postage is $3.00. Buy more than one glass slide and additional postage is only $1 each.